Boogey is an exciting new addition to our herd! 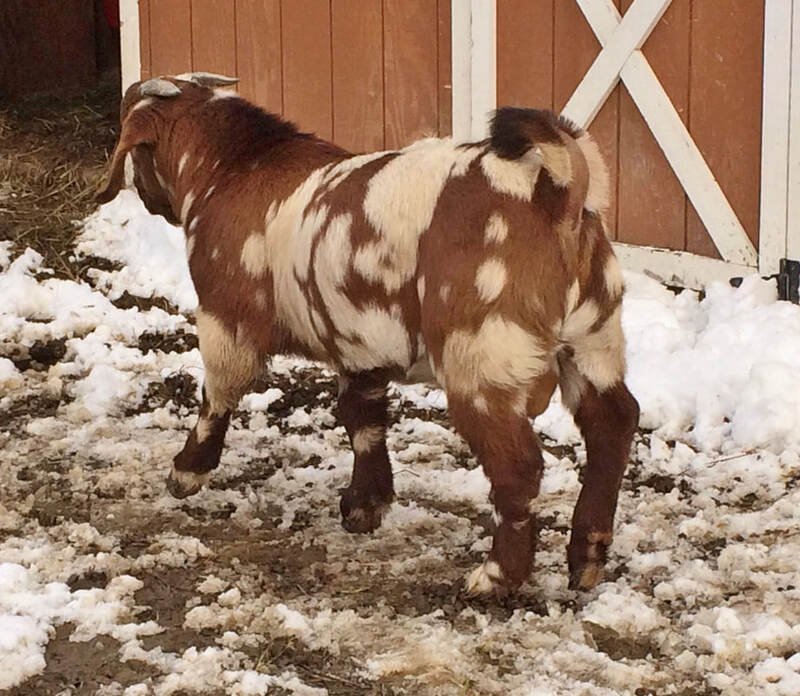 He came from Dodgers Boer Goats in Minnesota! He is Copperhead and Back 2 Nature Polar Express bred. He has the length, width, bone and overall appearance we are striving for with our herd and feel he will cross very well with our does! Chevy brings some exciting genetics to our herd! We bought his dam bred in the Splash of Color sale. Unfortunately she had a rough labor and ruptured her uterus and we lost her. Both her buck kids turned out phenomenal! Chevy has 3LF Graffiti, 3LF Copout, RRD Ruger T307, K&R's Static, T4 Scorpio and Bon Joli Diamondback in his immediate pedigree! Gunner brings some new bloodlines to our herd that we feel will cross well with our does. We love the length and muscle he carries for a black dapple buck. His grandsire on the top side is DBRC Batman and his grandsire on the bottom side is the newly ENNOBLED S G R IMA Smokin' Gun! We are anxiously awaiting his first kids in early 2017! Blackout is a very nice, young black buck. Bon Joli/Lazy S-T Copperhead is his grandsire on the top side and Midnight Prince ELR is his grandsire on the bottom side. He has a super nice pedigree and has crossed well with our does. Pictured below are a few of his kids from the 2016 kid crop! 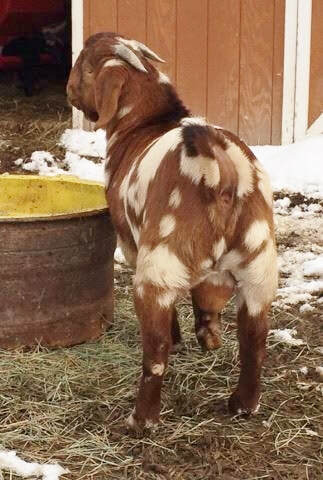 He has Fern Hollow Farm Ruger's Striker Fire, RRD Ruger T307, RRD Brass Shot S916, Logan Hill Mr. Maker's Mark, T4 Redneck, Max Boer Goats Red Hot Unleashed, Max Boer Goats Red Hot $, and Logan Hill Are-You-Looking-At_Me in the first 3 generations! Both his sire and dam are dappled.